Lack of name recognition is not a problem Jeb Bush will suffer, should he run for president in 2016. Son of one president and brother of another, the former governor of Florida -- the country's largest swing state -- is a well-known commodity, though he's been out of electoral politics for over eight years. Bush's acknowledgement in December that he would "actively explore" a presidential bid quickly reordered the 2016 GOP landscape. Since then, his aggressive fundraising for a super PAC and his assiduous behind-the-scenes courtship of donors and party officials have underscored how seriously he's taking the enterprise. Bush's potential rivals have taken note, with several accelerating their timelines to try to slow him down. If he runs, Bush can count on strong support from the GOP establishment, but he'll need to address concerns among the conservative base about his stance on several issues, notably immigration and education. He'll also have to grapple with the complicated legacy of his brother, former President George W. Bush. John Ellis Bush (J-E-B) was born in Texas on February 11, 1953, the second oldest son of Barbara and George H.W. Bush. After finishing a degree in Latin American Studies from the University of Texas at Austin, he worked for several years in Caracas, Venezuela, for a Texas-based bank, returning to the U.S. in 1980 to work on his father's presidential campaign. George H.W. Bush was elected vice president later that year and president in 1988. After the 1980 campaign, Jeb Bush moved to Florida to begin his own run up the political ladder. He became the chairman of the Miami Dade County Republican Party, and he was selected as Florida's secretary of commerce in 1987 by then-Gov. Bob Martinez. He staged his own run for governor in 1994, but he narrowly lost to the sitting Democratic governor, Lawton Chiles. In 1998, Bush ran again and was elected the 43rd governor of Florida. Will the third time be the charm for Mitt Romney? As governor, Bush was credited with overhauling the state's education system and sharply reducing the state's tax burden. He signed legislation partnering the state with the federal government to restore the Everglades, and he also pushed through an overhaul of the state's medical liability laws. He was reelected in 2002 by a wide margin, the first Republican to win a second term as governor in the history of Florida. "Jeb was a very popular governor, he was a very successful governor," said Florida-based strategist Rick Wilson in an interview with CBS News. "He really, at the time, set a national model for how a conservative legislative path could be carved in a state...that had been controlled largely by Democrats for decades." Wilson believes Bush would be more likely to win Florida's 29 electoral votes in 2016 than any other potential Republican nominee, with the possible exception of Florida Sen. Marco Rubio. Outside of Florida, Bush may be best known for being governor of Florida during the recount of the state's 2000 presidential election ballots. He recused himself from the process, and his brother, then-Texas Gov. George W. Bush, ultimately won the disputed election after the Supreme Court halted the recount. If he runs in 2016, his famous name will undoubtedly offer some early advantages. In addition to his robust name ID, Bush will be able to tap into a national network of donors cultivated by his brother and father, along with his own donors in Florida, giving him an almost-unmatched fundraising base. He hopes to raise $100 million in the first three months of 2015 -- a staggering sum that could dissuade some potential primary challengers. With the possible exception of Mitt Romney, Bush is likely to be the establishment favorite in a crowded GOP field. "There is a primary for establishment support, and Jeb Bush right now is setting the pace for that primary," said Michael Gerson, a former speechwriter for George W. Bush, last week on "Face the Nation." "He is forcing other people -- Romney, Christie, in particular -- to act and to react in this. He is running the best pre-campaign of all the candidates. He has been transparent, letting out his e-mails and tax material. He has been nimble. He has used social media. He is showing, 'I am in this for real,' and forcing the rest of the field to react." Despite his ties to the establishment, Bush has also signaled he intends to campaign as a kind of Republican reformer who won't hesitate to disagree with his party when necessary, who's willing to speak hard truths and broaden the GOP's appeal for the sake of the party's future. He said in December that the eventual Republican nominee must be prepared "to lose the primary to win the general, without violating your principles." "We don't have to make a point any more as Republicans," he said. "We have to actually show that we can, in an adult-like way, we can govern, lead." Winston described Bush's appeal among Latinos as "one of his strengths," suggesting it would help him "clearly develop a majority coalition if he's the nominee." That electability argument, even considering Bush's policy apostasies, could be a winner in the primary, especially after Republicans have lost two consecutive presidential elections. "Electability does matter," Winston said, "and it will matter significantly to this primary electorate." Bush did well among Latinos in Florida during both of his gubernatorial runs. Exit polls in 1998 showed Bush winning 61 percent of the Hispanic vote, though it should be noted that the state's Latinos, many of whom are Cuban-Americans, are more conservative than the broader U.S. Latino population. Bush also has no small measure of diversity in his own family: His wife, Columba, is a Mexican immigrant. She and Bush met during a 1971 trip to Mexico, where Bush was teaching English. The two married in 1974, and they have three children. The sight of Bush's biracial family on the stump could be a powerful symbolic asset for Republicans. Bush is also fluent in Spanish. Frank Sharry, the director of a pro-immigration reform group, told CBS News in December that Bush's "brand, and his record, and his family background give him a chance to compete [for Latinos] in a way that no other GOP leading contender can claim." Bush supports comprehensive immigration reform, including a path to legal status for undocumented immigrants. He's urged his party to take a more compassionate view of immigrants, even those who come to the U.S. without proper documentation: Last April, he described illegal immigration as an "an act of love," because many of those who migrate do so to help their families. On the question of whether undocumented immigrants should get a path to legal status or a path to citizenship, Bush has contradicted himself. In 2012, he suggested that a path to citizenship should be part of comprehensive reform. But in his 2013 book, "Immigration Wars: Forging an American Solution," he argued that immigrants in the U.S. illegally should be given permanent legal residency, but not citizenship, to safeguard the "integrity of our immigration system." After his book was published, critics pounced on the discrepancy. Bush has since remained vague on the specifics of where the path for the undocumented should lead, but he has maintained his support for comprehensive reform and on Friday referred to immigrants as "an engine of economic vitality." As governor, Bush championed education reforms that emphasized student testing and expanded charter schools and school vouchers. More recently, he's spoken out in favor of federal "common core" student standards. That position puts him at odds with much of the Republican base, which views the standards as an unconstitutional federal intrusion into education policy, but Bush hasn't backed down: During a speech in Washington last November before the education reform group he co-founded, he said the conversation surrounding the issue was "troubling," and he challenged his opponents to ante up: "In my view, the rigor of the Common Core State Standards must be the new minimum in classrooms. For those states choosing a path other than Common Core, I say this: Aim even higher, be bolder, raise standards and ask more of our students and the system." Bush has called for corporate tax reform that would lower the rate in exchange for closing targeted loopholes. He's also distinguished himself from many Republicans by suggesting he could accept some new tax revenues in exchange for larger spending cuts as part of a deficit reduction package. He's criticized President Obama's recent proposal to increase capital gains taxes on upper income-earners and taxes on inherited wealth. "We need to create economic opportunity for every American, especially middle class families and those trying to rise out of poverty," Bush said on Facebook earlier this month. "It's unfortunate President Obama wants to use the tax code to divide us -- instead of proposing reforms to create economic opportunity for every American. We can do better." Bush has been less eager to wade into foreign policy issues, offering standard criticisms of President Obama's approach to global hotspots like Iraq and Ukraine without offering a detailed alternative. Unsurprisingly, given his roots in Florida politics, one issue on which he's been more candid is U.S. policy toward Cuba. Bush slammed Mr. Obama's decision to normalize U.S.-Cuba relations in December, saying the move "undermines America's credibility and undermines the quest for a free and democratic Cuba." He's long opposed efforts to lift the U.S. embargo against Cuba, even suggesting earlier last year that the embargo should be strengthened. While the name ID and donor network his last name provides are big assets, Bush's family will also saddle him with some baggage. George W. Bush was deeply unpopular when he left the presidency in 2009, and though his poll numbers have since recovered, he remains toxic among Democrats and unpopular among independents. "Modern Republican primary voters have moved away from the 'compassionate conservatism' argument rather starkly," said Wilson, in reference to George W. Bush's 2000 campaign slogan. "They view it as code for more spending, and Jeb needs to work that question with them....He's gonna have to have a different and tougher spending line." There's also the more basic question of whether voters might just be tired of Republican candidates with the the last name Bush. Democratic pollster Peter Hart recently organized a Colorado focus group on voter sentiment and found that Jeb Bush did not fare well among the possible 2016 contenders, with half of the twelve participants saying they'd "back a law to bar all Bushes and Clintons from running," according to CBS News Political Director John Dickerson. At the Iowa Freedom Summit this weekend, several speakers tore into Bush's support for immigration reform and common core. Winston suggested Bush's positions on immigration and education "are potentially controversial in terms of the primary," but he said Bush could simply keep the focus of his primary campaign elsewhere: "Does he lead with those issues, or does he focus on the economy more broadly?" 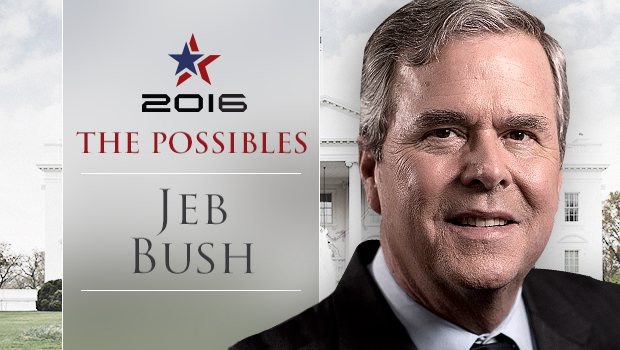 Finally, it's not clear Bush has the GOP establishment as firmly in his grip as he'd like. The re-emergence of Mitt Romney, the 2012 Republican nominee, could pose a real threat to Bush's primary bid, particularly if Romney is able to keep a sizable chunk of his biggest donors.